Art Fried is an artist who brings beauty, meaning, and grace to his Ketubah creations through his exquisite expressions and designs. He had created traditional works of art for friends many years ago. More recently, he designed Ketubahs for some of his friends’ children as they took their wedding vows. He creates both modern and traditional Ketubahs, whichever are chosen they are assured that each will be meticulously crafted and flawlessly designed. Its pure elegance will adorn the walls for a lifetime to come. Born in Brooklyn, Art was the oldest of 11 children. He was raised in a traditional orthodox Jewish family but took his own respectfully independent but rich path from the very focused culture. As a child, he used to spend hours with his mother as she found joy in her own creativity. Art refined his creativity as the years went by. He went from crayon drawings on the wall to calligraphy, monograms, invitations and ketubahs with boundless pursuits of his imagination. Inspired by the success and the encouragement from his mother, he spent the next 20 years as a full-service advertising agency specializing in graphics and design. The success of his business brought in clients such as Tofutti, Pepperidge Farm, Devils Jeans, Ethan Alan and Baldwin Piano. Art has sold his advertising business. He has never lost his love for his art or his creative flare. As a man taking a new business adventure, he has returned to creating elegant and purposeful fine art of ketubah designs. Art Fried has started his new venture by embracing his culture and embarking on his business, Ketubahs by Art Fried. 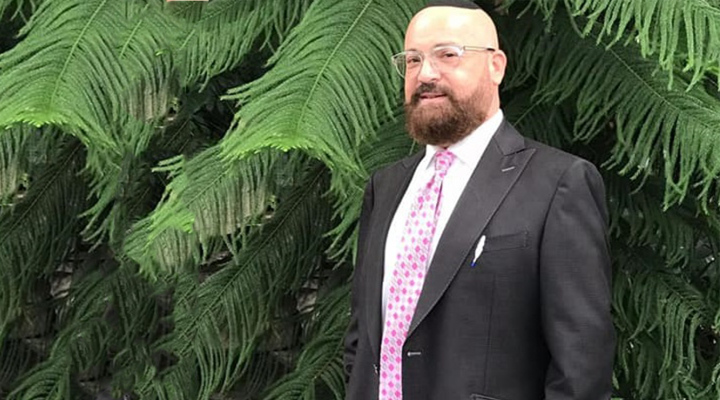 He has launched his new website, where he has begun to engage friends and family and people of all denominations preparing for their wedding and is in search of the artistry of their ketubah. How did you get started as an artist? What inspired you to start Ketubahs by Art Fried? I was the oldest of 11 children in a Chasidic Jewish family and religious traditions and culture were parts of my heritage. I was always artistic and creative. I made a name for myself in my neighborhood when I was a teenager as “The Wonder Boy Ketubah Kid.” I was skilled at hand calligraphy. I started working in advertising in my 20s, then went into the ATM business, and went into the real estate business too. But, I missed using my creativity and a lot of friends and previous clients were asking me to design ketubahs for them. I’ve always been determined, adaptable, focused, and a forward thinker, so I knew I could make Ketubahs by Art Fried work. I love creating original and one of a kind ketubahs that adorn my clients’ walls for years to come and remind them of the day that two people became one. Ketubahs by Art Fried is a work in progress. The good thing is that I didn’t have anything to purchase. I had all of my creative knowledge from the Advertising Agency. I also completed graphic projects for close friends and family. There were no initial overhead expenses. So, anything that I make is profit from day one. I have to get the word out and I know this is something that I am good at. So, I am sure that it will be a matter of time when it is actually self-supportive. I also kept up with the graphics and the technology. I still have my Mac and Illustrator, Photoshop and all of my marketing programs. I kept up with the whole arena. There was never a time that I doubted it would work. When I was fourteen years old I was creating ketubahs by hand. I made quite a lot of money at that time. It was not the main focus in my life but it was a good source of income for me at that time. It is only now that I am fully focused on making this a serious business. The first ketubah that I made was for a friend of mine when we were very young. After I did that, other people asked me to make their ketubahs. Some people I knew, some people came as word of mouth spread. So far Ketubahs by Art Fried has been generated by word of mouth. I am really just getting started so I am in the process of working on strategies to bring business to my site. I recently hired a person to see if we can generate some customers through social media. But it is too early to see how it is going to work. I have such a beautiful variety of fine art designs. A ketubah is very personal to each couple. Making ketubahs is something that I have done so well in the past. I pay attention to detail and I make sure my customers are happy with my designs. I know that this is something that they will adorn their walls for the rest of their lives together. I am always satisfied when I have a happy customer. A ketubah is a cherished part of the wedding preparations. It is the heart in the marriage certificate created into a work of art. It is the emotions and declaration of their love displayed for all to see. What does the future hold for Ketubahs by Art Fried? What are you most excited about? Since I am just starting to take it to the masses now, I am hoping to grow Ketubahs by Art Fried nationwide through my ketubahsbyartfried.com site. What will really excite me is when I can be doing this business while I travel the world. This business is going to be done no matter where I am in the world. I’d like to do it sitting in a Paris hotel or perhaps on the beach! I am really happy that I didn’t have to make any purchases to start Ketubahs by Art Fried. I invested in the development of my new website and I am very satisfied on how it came out. I think the website is very informative and beautifully presented. What is the most important thing you would like to share about people looking to purchase a Ketubah? When you are searching for your ketubah, treat it like you are purchasing the masterpiece of your life.